From the classroom to the conference room, Hitachi’s cost-effective CP-EX252N LCD projector combines superior image clarity, high quality value, and long-life reliability. Bright, vivid colors with razor-sharp text and bold graphics will truly enhance any lesson or meeting and make it more memorable. For added security, the CP-EX252N includes PIN lock protection which can limit projector users. An MS-1WL wireless multifunction switcher is available for the CP-EX252N and operates in conjunction with the receiver to provide expanded source selection and switching options for connected devices. Plus, Hitachi’s Intelligent Eco Mode with ImageCare combines optimal picture performance with maximum energy savings for a lower total cost of ownership. For added peace of mind, Hitachi’s CP-EX252N is also backed by a generous warranty and our world-class service and support programs. 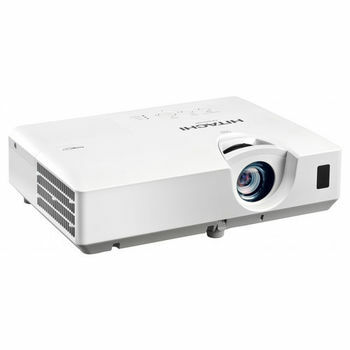 Hitachi CP-EX252N XGA 3LCD Projector From the classroom to the conference room, Hitachi’s cost-effective CP-EX252N LCD projector combines superior image clarity, high quality value, and long-life reliability. Bright, vivid colors with razor-sharp text and bold graphics will truly enhance any lesson or meeting and make it more memorable. For added security, the CP-EX252N includes PIN lock protection which can limit projector users. An MS-1WL wireless multifunction switcher is available for the CP-EX252N and operates in conjunction with the receiver to provide expanded source selection and switching options for connected devices. Plus, Hitachi’s Intelligent Eco Mode with ImageCare combines optimal picture performance with maximum energy savings for a lower total cost of ownership. For added peace of mind, Hitachi’s CP-EX252N is also backed by a generous warranty and our world-class service and support programs. ImageCare Technology ImageCare is a lamp power control function that combines optimal picture performance with maximum energy savings by decreasing energy usage, improving contrast ratio and lengthening lamp life. The result is a lower total cost of ownership and decreased maintenance cost. Intelligent Eco and Saver Modes Automatically changes the brightness of the lamp according to the brightness level of the screen. Also, automatically changes the brightness of the lamp if there is no change in the screen image. Using ImageCare technology, these features give optimal picture performance with maximum energy savings. PIN Lock / MyScreen / MyText PIN lock protection can limit projector users. MyScreen PIN lock keeps captured images on the startup screen. Users can set any name logo to MyScreen, clearly identifying ownership. MyText provides the ability to write text on the startup screen such as model name, serial number or location. Network Control, Maintenance and Security Embedded networking gives you the ability to manage and control multiple projectors over your LAN. Features include scheduling of events, centralized reporting, and e-mail alerts for reactive and routine maintenance.